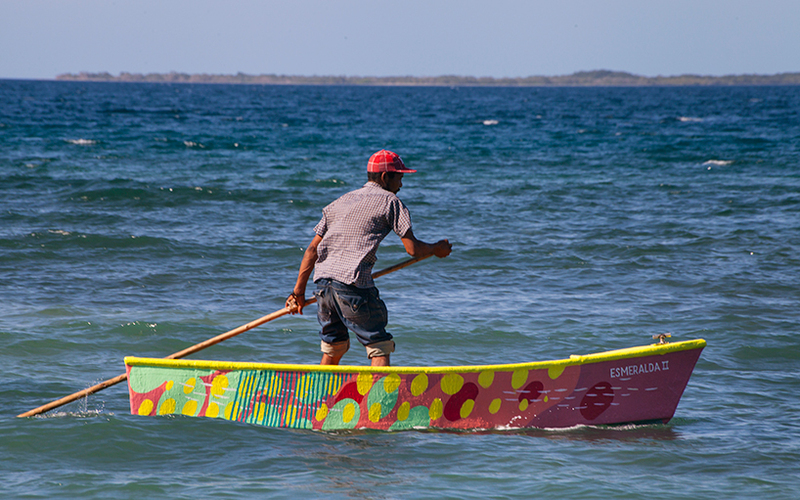 the dominican republic’s northwest most hand reaches out to dip its fingertips in the masacre river, boarding haiti. 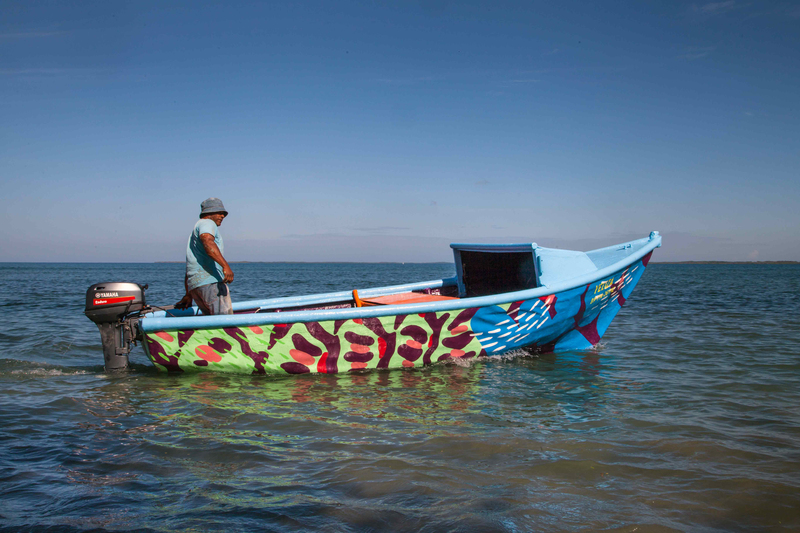 right there at the border, during the month of february, spanish public art collective, BOA MISTURA painted fifty-two boats with the help of caribbean fishermen and their families. the town’s geography is a precarious one. when BOA MISTURA arrived in the extreme northwest of the dominican republic they unavoidably found themselves in monte cristi, the province along the coast, but their journey mostly took place just a touch even farther west in a village called pepillo salcedo. 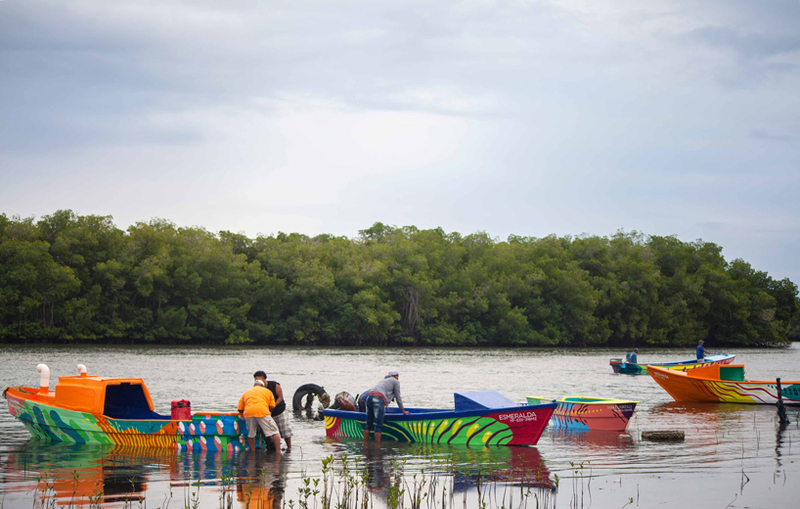 little wetlands, lagoons and mangroves, little electricity, poor garbage-collection and minimal running water: a slice of rich-earth and waves of wealthy-waterways collide with abandonment and rust in fishing community, estero balsa. 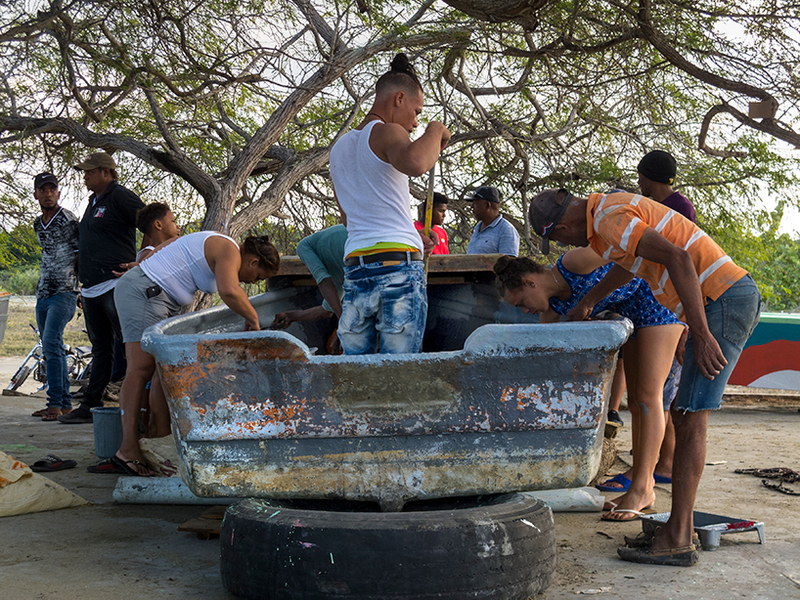 this community — which BOA MISTURA visited and ultimately dedicated their latest palettes to — housed more than 50 rusty boats and families that reflected mollusk-infested hardships rather than the shiny, bright parrotfish that chew on algae below. the process lasted one month of trudging through water and loving labor. 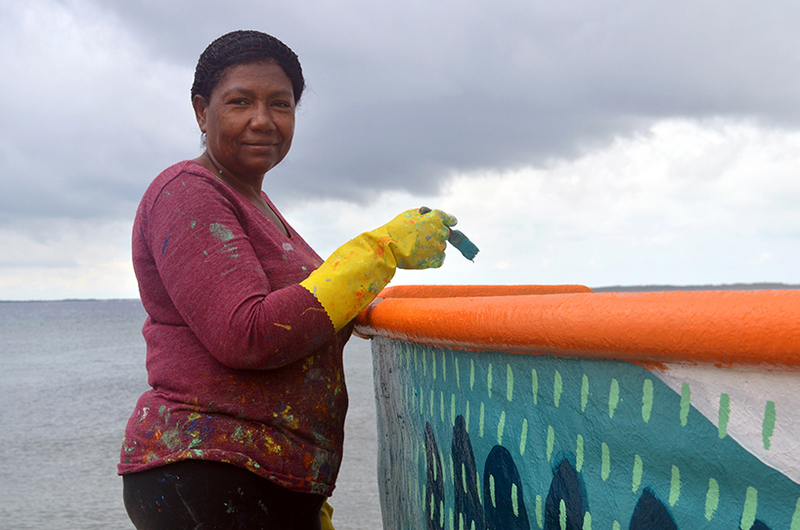 every day, from the mangrove area, fishermen took their boats to the makeshift shipyard on los coquitos beach to be painted. 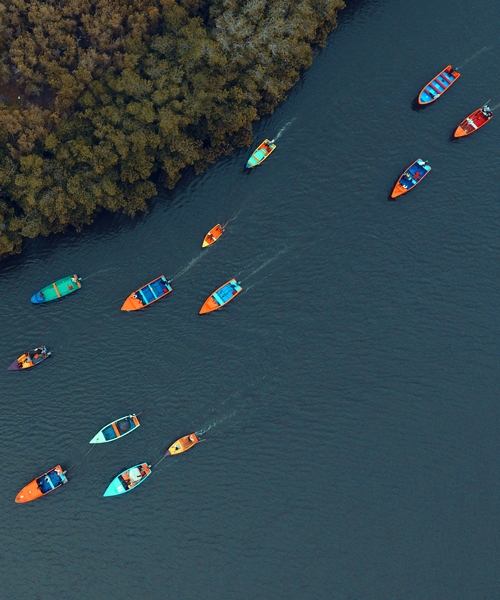 they took them by land, towed by neighbors, paddling for more than an hour or lending each other engines to turn their boats into canvases. 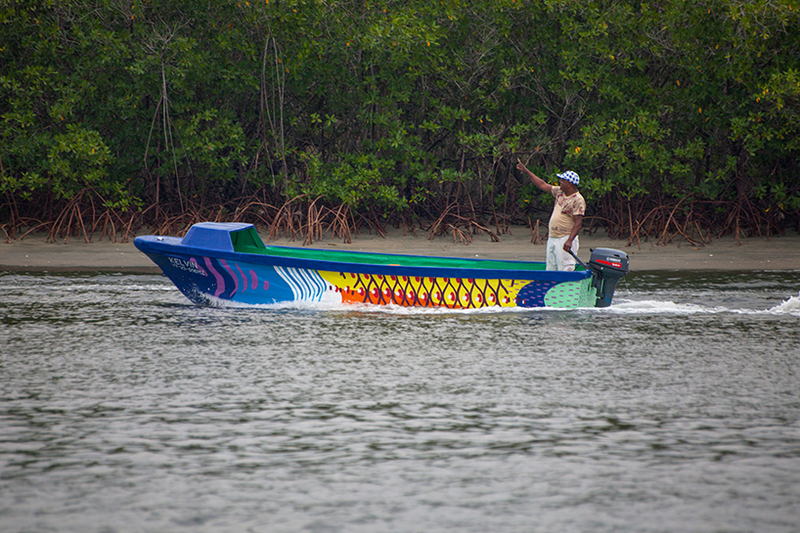 the fishermen themselves and their families were responsible for sanding old woods, removing the mollusks, conducting repairs with fiberlglass, and applying protective primers to each boat, so BOA MISTURA could focus on what they do best — painting with colors that shout proud, unapologetic messages to the world. above, the esmeralda II paddles around. 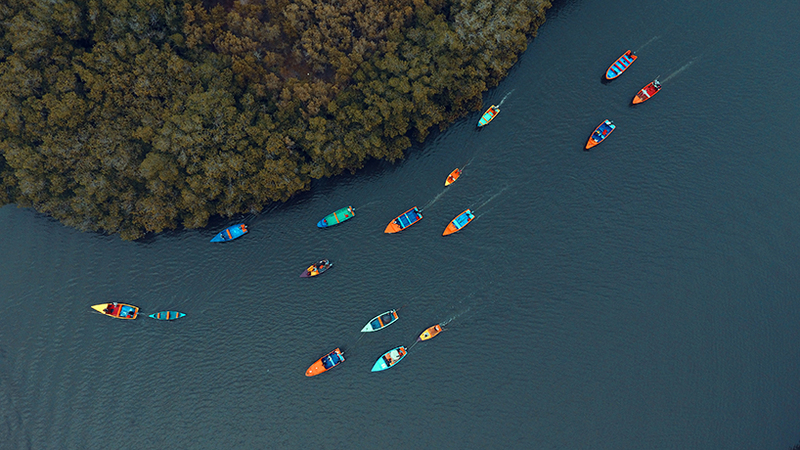 pinks and greens, polka dots and lines may all appear surreal, or abstract, but these patterns and colors were directly inspired by a known and respected species of the caribbean marine ecosystem, the parrotfish. parrotfish have special relevance in the caribbean. parrotfish don’t just slide around like the eccentric DJ hipster house partiers of the sea, dressed in rad colors and patterns; they’re custodians of the coral reefs — eating their algae, cleaning them and contributing to the prosperity of the entire caribbean marine ecosystem. a single parrotfish produces 100kg of white sand per year. despite being a protected species, the illegal fishing of the parrotfish is endangering the balance of tropical ecosystems. 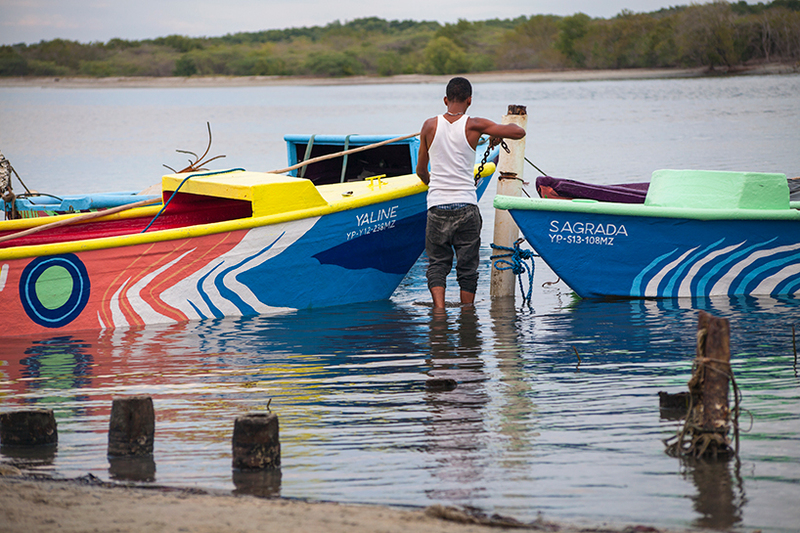 about fifty boats were painted during the project’s four week lifespan. 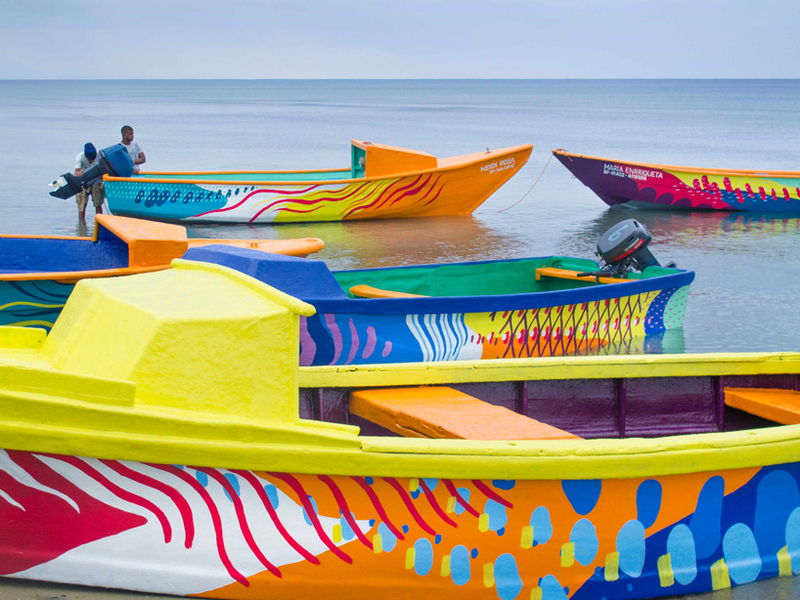 52 yolas (as they call their boats) that sail the waters of the bay of manzanillo dressed in the skins of the parrotfish — a school of fish that carries the colorful and diverse flags of conscience and duty for the marine environment, so fragile and so necessary, not only for the development of the fishing areas, but for the entire planet.